Note: Winners are announced during the ALCQ-ACQL’s annual reception at Congress of The Humanities and Social Sciences. McKegney, Sam. “‘pain, pleasure, shame. Shame’: Masculine Embodiment, Kinship, and Indigenous Reterritorialization.” Canadian Literature 216 (2013): 12–33. Williams, David. “Spectres of Time: Seeing Ghosts in Will Bird’s Memoirs and Abel Gance’s J’accuse .” Canadian Literature 219 (2013): 113-30. Jamieson, Sara. “‘Surprising Developments’: Midlife in Alice Munro’s Who Do You Think You Are? ” Canadian Literature 217 (2013): 54–69. Szabo, Lisa. “Adventures in Habitat: An Urban Story.” Canadian Literature 218 (2013): 67–84. 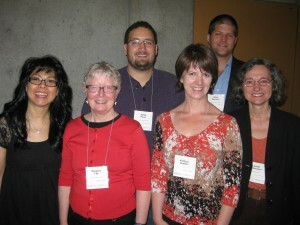 Deanna Reder, Susan Gingell, Allison Hargreaves, Daniel Heath Justice, Kristina Bidwell, and Jo-Ann Episkenew. “Thinking Together: A Forum on Jo-Ann Episkenew’s Taking Back Our Spirits: Indigenous Literature, Public Policy and Healing.” Canadian Literature 214 (Autumn 2012): 91-127. Germaine Warkentin. “The Age of Frye: Dissecting the Anatomy of Criticism, 1957–1966.” Canadian Literature 214 (Autumn 2012): 15-29. I. S. MacLaren. “Paul Kane’s Wanderings of an Artist and the Rise of Transcontinental Canadian Nationalism.” New Work on Early Canadian Literature. Ed. Janice Fiamengo and Thomas Hodd. Spec. issue of Canadian Literature 213 (Summer 2012): 16-38. Richard Brock. “Body/Landscape/Art: Ekphrasis and the North in Jane Urquhart’s The Underpainter. ” Canadian Literature 212 (Spring 2012): 11-32. Ana María Fraile-Marcos. Urban Heterotopias and Racialization in Kim Barry Brunhuber’s Kameleon Man. Canadian Literature 214 (Autumn 2012): 68-89. Meredith Quartermain. “T’ang’s Bathtub: Innovative Work by Four Canadian Poets.” 21st Century Poetics. Ed. Clint Burnham and Christine Stewart. Spec. issue of Canadian Literature 210-211 (Autumn/Winter 2011): 116-132. Annette Hayward. “Littérature et politique au Québec pendant la première moitié du vingtième siècle: Prolégomènes.” Spectres of Modernism. Ed. Dean Irvine. Spec. issue of Canadian Literature 209 (Summer 2011): 68–88. Alan Filewod. “Authorship, Left Modernism and Communist Power in Eight Men Speak.” Canadian Literature 209 (Summer 2011): 11-30. Annette Hayward. “Littérature et politique au Québec pendant la première moitié du vingtième siècle.” Canadian Literature 209 (Summer 2011): 68-88. Karl Jirgens. “Neo-Baroque Configurations in Contemporary Canadian Digital Poetics.” 21st Century Poetics. Spec. issue of Canadian Literature 210-211 (Autumn/Winter 2011): 135-151. Eli MacLaren and Josée Vincent. “Book Policies and Copyright in Canada and Quebec: Defending National Cultures.” Canadian Literature 204 (Spring 2010): 63-82. Michel Nareau. “La nation à l’épreuve d’un récit métis: Ouvrir le Québec par le biais hispano-américain dans l’oeuvre de Francine Noël.” Canadian Literature 204 (Spring 2010): 27-42. Susan Billingham. “Écriture au Trans-féminine: Trish Salah’s Wanting in Arabic.” Queerly Canadian. Ed. Janice Stewart. Spec. issue of Canadian Literature 205 (Summer 2010): 33-51. Lee Rozelle. “Liminal Ecologies in Margaret Atwood’s Oryx and Crake.” Canadian Literature 206 (Autumn 2010): 61-72. Y-Dang Troeung. “Forgetting Loss in Madeleine Thien’s Certainty.” Canadian Literature 206 (Autumn 2010): 91-108.